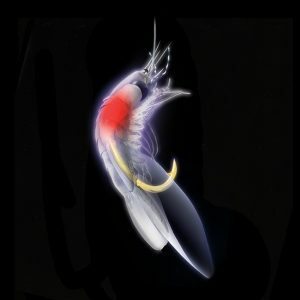 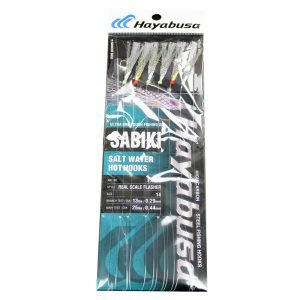 If you prefer the Sabiki® – EX122 – Holographic Sheet & White Flasher – Hologram Finish as one of your go-to saltwater fishing rigs, then it only makes sense that you will equally appreciate the Sabiki® EX123 – Feather White & Flash Yarn as a similar model that recreates fleeting balls of baitfish that larger baitfish and game fish eat. 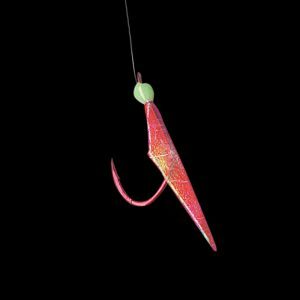 Saltwater fishing requires adaptability and fishing rig variety to be successful. 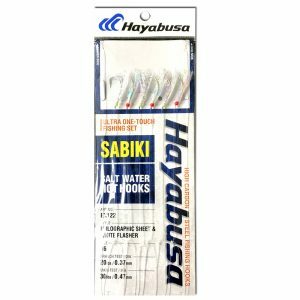 Don’t hesitate to use similarly styled Sabiki® saltwater fishing rigs with minor differences that could mean the difference between a successful fishing trip and poor fishing trip. 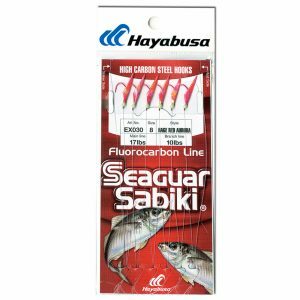 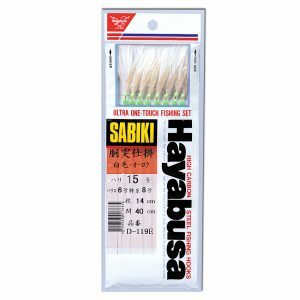 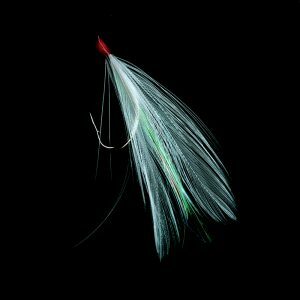 The Hayabusa Fishing Sabiki® D119E – Feather & Yarn Mackerel Fish Skin is a similar rig design, but it features 8 branch line hooks. 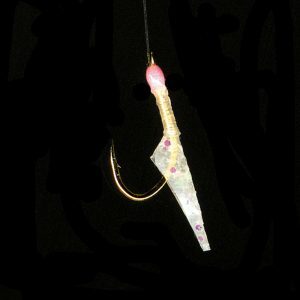 Give it a try if the fishing proves difficult! 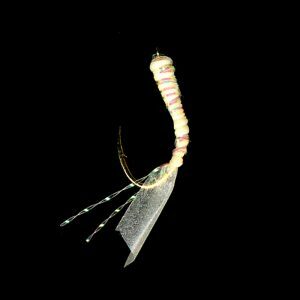 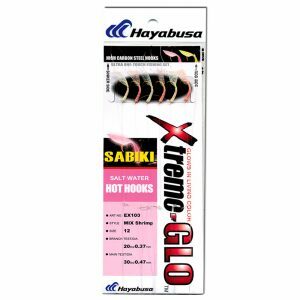 Fishermen looking for less branch line fishing hooks should consider the following two products as productive saltwater fishing rigs: the Hayabusa Fishing Sabiki® EX001 – Mix Shrimp – Glow Finish and Sabiki® EX020 – Pearl Fish Skin. 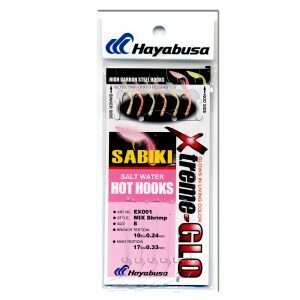 Fishermen wanting to amass a large variety of Hayabusa Fishing Sabiki® may consider the following two saltwater fishing rigs, as well – the Sabiki® EX020 – Pearl Fish Skin and Sabiki® EX030 – Hage Red Fish Skin – Aurora Finish. Both of these fishing products, in addition to the Sabiki® EX001 – Mix Shrimp – Glow Finish, will catch more baitfish and game fish in coastal waters. 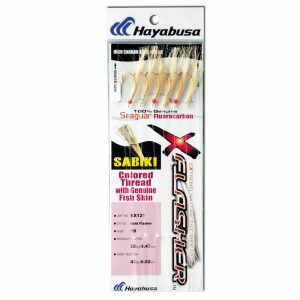 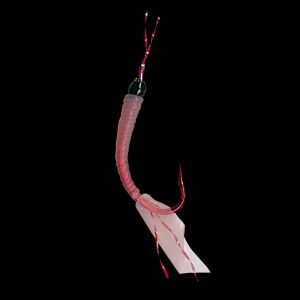 Coastal fishermen interested in a variety of Hayabusa Fishing Sabiki® saltwater fishing rigs should also consider the Sabiki® EX030 – Hage Red Fish Skin – Aurora Finish as productive fishing rig for baitfish and game fish. 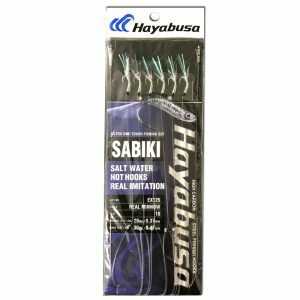 Coastal fishermen looking for another unique Hayabusa Fishing Sabiki® saltwater fishing rig should also consider the Sabiki® EX040 – Sliver Fish Skin – Hologram Finish, which has a different finish and style but could ultimately assist in catching quality baitfish and game fish, too. 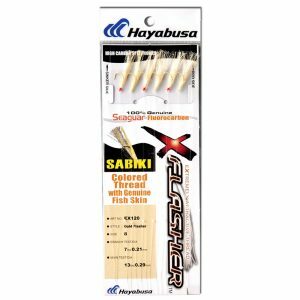 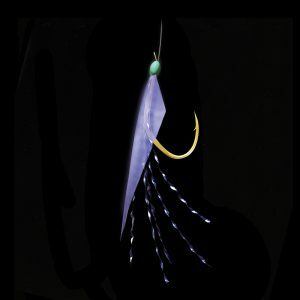 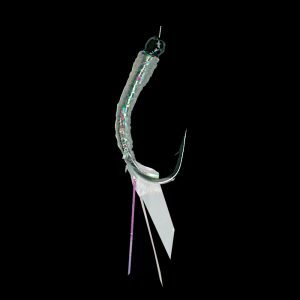 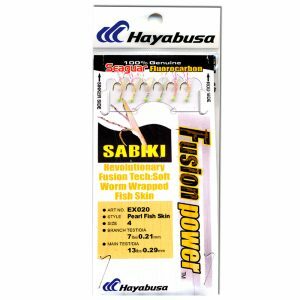 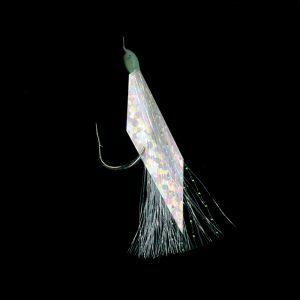 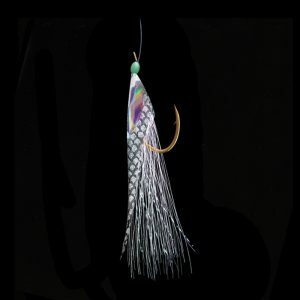 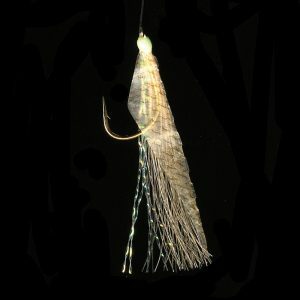 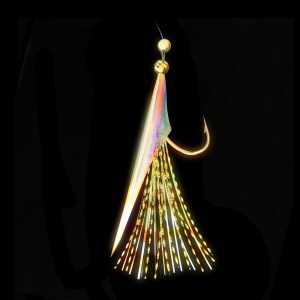 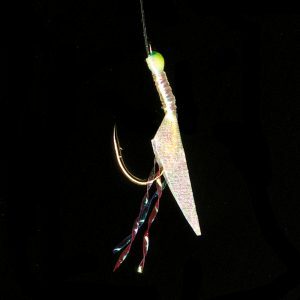 Coastal fishermen and saltwater fishermen looking for a similarly designed saltwater fishing rig (different type of hook, similar aesthetic design) should view Hayabusa Fishing’s Sabiki® EX110 – Silver Flasher Fish Skin – Hologram Finish. 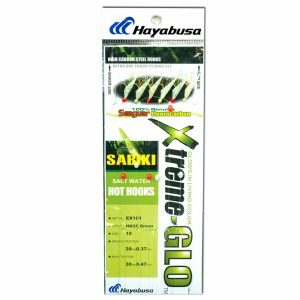 If you are looking for a Hayabusa Fishing Sabiki® saltwater fishing rig with a fluorocarbon branch line, view the Sabiki® EX101 – Hage Green Fish Skin – Glow Finish. 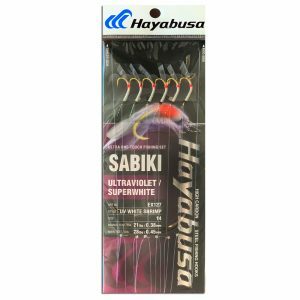 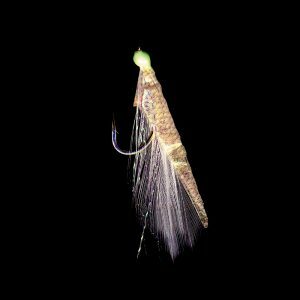 The Hayabusa Fishing Sabiki® EX110 – Silver Flasher Fish Skin – Hologram Finish is a similarly designed Sabiki® saltwater fishing rig that coastal fishermen will find useful for catching baitfish and game fish. 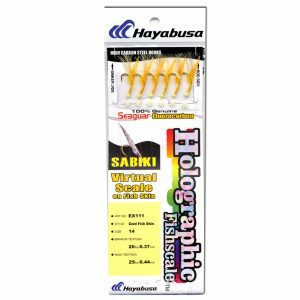 If you are looking for a variation of this product or similarly related component-wise, be sure to view the Sabiki® EX111 – Gold Fish Skin – Hologram Finish. 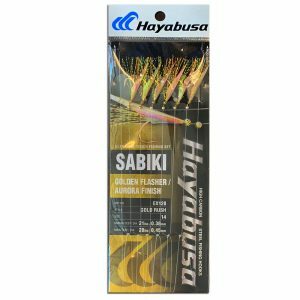 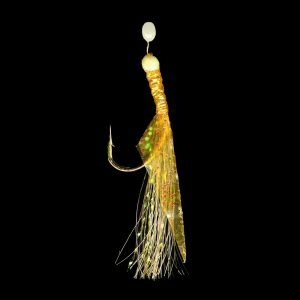 Saltwater fishermen will also want to purchase the Sabiki® EX121 – Gold Flasher & Fish Skin, which is similar in style but features different fishing hooks, for catching quality baitfish and game fish. 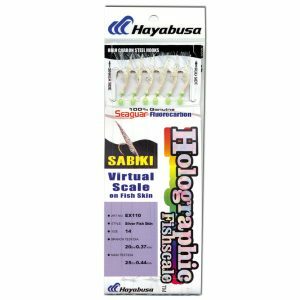 For a similar Hayabusa Fishing Sabiki® saltwater fishing rig, saltwater fishermen will also want to purchase the Sabiki® – EX122 – Hologram Sheet & White Flasher – Hologram Finish, which has become an elite Sabiki® fishing rig. 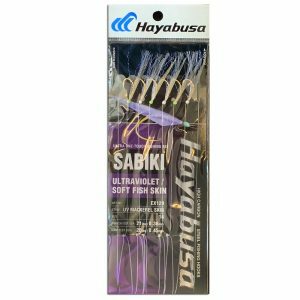 For a similar Hayabusa Fishing Sabiki® saltwater fishing rig, coastal fishermen will also want to purchase the Sabiki® – EX122 – Hologram Sheet & White Flasher – Hologram Finish, which has become one of the premiere Sabiki® fishing rigs in the world. 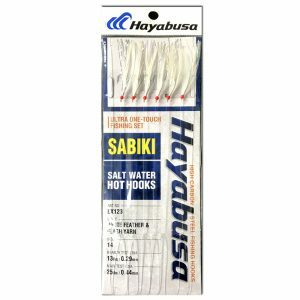 Saltwater fishermen who trust Hayabusa Fishing’s Real Sabiki® must also consider purchasing the Sabiki® EX125 – Real Minnow, one of Hayabusa’s fastest selling models. 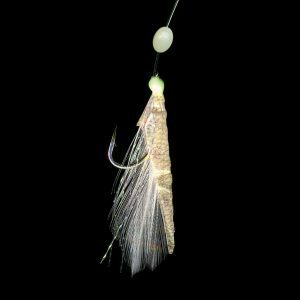 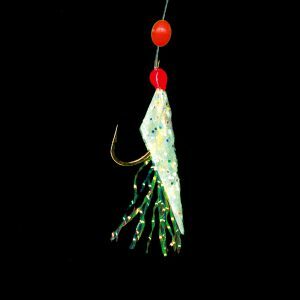 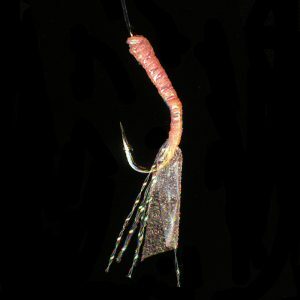 If realistic fishing rigs is what you need to catch baitfish and game fish, then you’ve come to the right place! 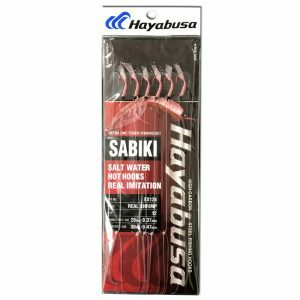 If you are looking for an entirely different type and style of Hayabusa Fishing Sabiki® saltwater fishing rig, be sure to view one of our most popular models that saltwater fishermen use on a regular basis – the Sabiki® EX140 – Hage Red Fish Skin – Aurora Finish, though different than the Sabiki® EX125 – Real Minnow but just as effective and essential in certain fishing situations.